Americans are now spending more than $17 billion a year on vitamin supplements for health and disease prevention. But strangely enough, the rates of some forms of chronic disease have not changed, while the rates of others have actually increased. I’ve always wondered why in America we consume the most vitamin & mineral supplements, yet we are still plagued by the very diseases and chronic ailments that the pundits claim will be eliminated or avoided if we use vitamin supplements. One thing obvious, most supplements aren’t helping very much. Consuming synthetic vitamins can increase your risk for illnesses like stroke or heart attack. Studies have shown that regularly ingesting synthetic vitamins can increase your chances for a stroke by 30 percent. So it’s important not only to get a high quality vitamins but also food derived vitamins, otherwise in the long term you will pay the price with your health. Our over consumption or refined and processed foods fortified with synthetic vitamins is western societies achilles heel, no one can argue that the best way to assimilate nature created vitamins and minerals is from wholesome organic fruits and vegetables. Even if we consume earth created vitamin supplements, through the isolation and extraction process they’ve been robbed of all the extra nutrients they naturally come with, which is not really healthy. Just like refined foods, these refined vitamins have been robbed of all of the extra accessory nutrients through the isolation and extraction process. Like refined foods, they can create numerous problems and imbalances in the body if taken at high dosages for long periods of time. Whole food supplements are supplements are made from concentrated whole foods. The vitamins found within these supplements are not isolated. They are highly complex structures that combine a variety of enzymes, coenzymes, antioxidants, activators, trace elements, and many other undiscovered factors all working together synergistically within the body. Nutrients in singularity or isolated from the whole should not be expected to do the same job in the body as the whole complex is designed to do. 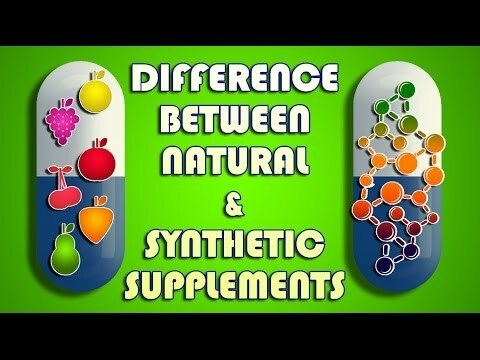 The human body can’t regulate the absorption of synthetic vitamins. Synthetic vitamins are mostly ineffective in preventing disease. Second, these chemicals may be dangerous to your health as some research has shown them to increase the risk of death. Many studies have shown an increased incidence of cancer and heart disease with the use of synthetic vitamins. Isolated or synthetic nutrients are not natural, in that they are never found by themselves in nature. Taking these isolated nutrients, especially in super high doses found in formulas today, is more like taking a drug. Studies show the body treats these isolated and synthetic nutrients like foreign substances. Food-based supplements are never treated like this by your body. For example, your urine will never turn fluorescent yellow, no matter how much nuts and grains(a good source of B vitamins) you eat. This sort of rapid excretion only happens with when foreign substances that are being expelled from your body. Identifying a natural vitamin from a synthetic one is no easy task. Many vitamin and mineral supplements may contain labels that are too complicated to decipher. Worse, many people may not even know what to look for in a vitamin or mineral supplement. Some manufacturers of commercial supplements add synthetics to vitamin products, typically to increase the vitamin’s potency, but many synthetics are made from derivatives of coal tar – a known carcinogen found in second-hand cigarette smoke. Look for the words “100 percent natural” on the product’s label. Some labels may contain the words “natural,” but manufacturers can claim “natural” on their nutritional products if at least 10% of the product comes from natural food sources. The Organic Consumers Organization recommends looking for products that contain “100 % plant-based” or “100 % animal-based” on the label. Find the “food source” list on the product’s label. If the label doesn’t contain a list of natural food sources, then the product is synthetic. Look for food sources such as yeast, fish, vegetable, and citrus. Identify whole foods in the ingredient list instead of the particular nutrient. Look for foods on the list of ingredients that contain a certain vitamin, such as “acerola cherry powder,” which contains vitamin C. If you can identify “vitamin C” in the ingredient list, Kim says you can almost guarantee that the vitamin is synthetic. Talk to a pharmacist or nutritionist before purchasing a vitamin or mineral supplement. They can identify a natural or synthetic vitamin supplement that you need. Also, let your pharmacist know if you are allergic to any foods or medications. Beware of the term “natural”. The use of the word natural has reached an incredible level of abuse. What exactly is the state of Samadhi?